Lifetime risk of developing cancer: approximately 38.5 percent of men and women will be diagnosed with cancer of any site at some point during their lifetime, based on 2012-2014 data - National Cancer Institute. Cancer is a scary disease that about 4 out of 10 people will develop in their lifetime. These are staggering numbers for such a life threatening disease, and those 4 people will most likely need help during their fight for life. At Affordable Home Care, our caregivers all participate in a proprietary education program that teaches advanced home care techniques directed at specific conditions and diseases. One of our specialty programs is directed at cancer care. Our cancer care program was developed by a Registered Nurse utilizing resources and guidance from some of the leading cancer institutions in Arizona. Our program teaches our professional caregivers to watch for signs that there are changes in condition and what to do during those changes. They even keep records for follow-up with primary care doctors to help with their recommendations in care. Cancer is a scary diagnosis, but it doesn’t mean you have to do it alone. 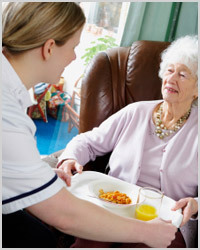 Call the professionals at Affordable Home Care who can help with your care every step of the way.